Why, you ask? Did I candy all my nuts and promptly eat them? Well, yes, but that's not the only reason. You see, this carrot cake is different because it's made with butter as the primary fat, not oil. I'll be the first to admit that one of the reasons I love making carrot cake is that it's usually a one-bowl affair. Wet stuff--oil, eggs, pineapple, sugar--gets mixed with dry stuff--flour, leavening agents, spices, nuts, raisins, coconut, what-have-you--and you're done, no mixer needed! While admittedly requiring a little more effort, this recipe is not one to ignore. It's less light and fluffy and more dense and hearty, almost like a pound cake. I skipped the common add-ins like nuts, coconut, pineapple, and raisins, in favor of enhancing the buttery richness and aromatic spices. While not the most amazing carrot cake in the world, I think it's definitely worth a try if you're in the mood for something different. How's that for high mid-level praise? Preheat oven to 350 degrees F. Grease three 9-inch round cake pans or put liners into 30 muffin cups. Whisk together flour, baking powder, baking soda, cinnamon, salt, ginger, and nutmeg and set aside. Beat butter and sugars with a mixer until pale and fluffy. Add eggs, one at a time, beating well after each addition; beat 3 minutes. Add vanilla and water and beat until well combined, about 2 minutes. Reduce speed to low and add flour mixture; fold in the carrots. Scrape batter into prepared pans, dividing evenly. Bake, rotating pans halfway through, until golden brown and a toothpick inserted into centers comes out clean, about 30 minutes. (Cupcakes take about the same amount of time, but check at 25 minutes.) Let cool in pans on a wire rack for 15 minutes. Run a knife around edges of cakes to loosen, and turn out cakes onto rack. Turn right side up, and let cool completely. Make the cream cheese frosting as directed. To assemble, place one cake on a serving platter and spread 1 cup of the frosting over the cake. Top with second cake. Spread 1 cup of the frosting over the cake. Top with the remaining cake. Spread the remaining frosting over top and sides. Refrigerate 1 hour before serving. You crack me up :) I will be proud to say 'I knew you when' after you've published your world famous coffee table book of comical cupcakes. This one looks like a bunny with one ear! That is so true, Easter should have carrot cake served...either for breakfast, afternoon snack, and dessert after dinner! :) I love your version of carrot cake with butter. I'm never really an "oil with cake" kinda girl. hahaha....wish you and your family a beautiful Easter weekend. 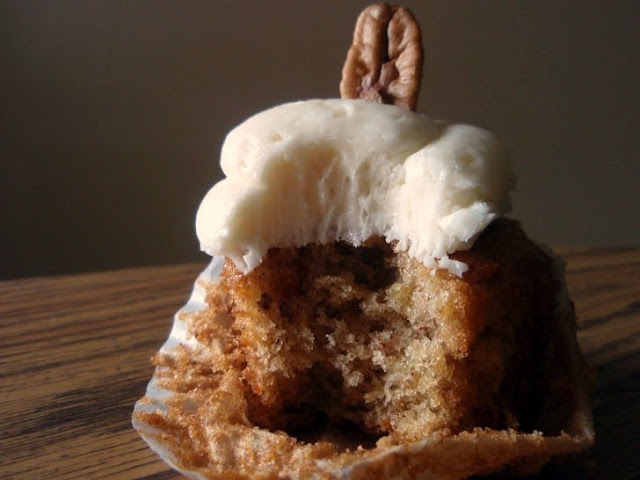 All southerners know the best carrot cake recipes. I'm with you...neuter the cake, as Julia always said...use butter, turn out a cupcake, frost it with cream cheese frosting ( the best part) and top it with a lone nut. Or even a jelly bean. Nobody's coming down this Easter, so a cupcake is the way to go. Carrot cake is my favorite cake - I love it. Using the butter makes it even more appealing to me! These cupcakes look super tasty! Carrot cake is my fiance's favorite. I used to not like it but he turned me onto it and now I am kind of obsessed with trying out as many different carrot-cake type recipes as I can haha. I must say, yours sounds fantastic! And I LOVE the way you decorated them. Hello, cute little pecan! I like recipes that stray from the traditional version. So if it ain't got no nuts, then it's a girl cupcake. But some girls have more nuts than guys. And now I am really confused but will be sure to use eunuchized in a sentence today! Oh you! You are too funny Grace. Wishing you and yours a heavenly Easter Grace. What a little beauty, the photos are wonderful and the cupcake is so enticing. This might salvage carrot cake for my nut-hating youngest (how did I get a child who hates nuts?)! Happy Easter! Carrot cake in any form is fine with me. Hope you had a great Easter! 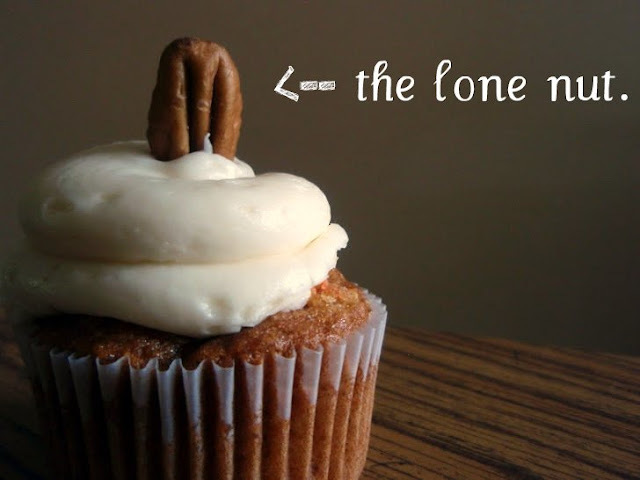 For years, I was true to one and only one carrot cake recipe. Lately though, I've been wanting to try some other varieties of carrot cake. This comes at just the right time! I think leaving it plain was the right choice! I like it plain to feel the flavor of carrot and butter! Delicious! I know what you mean, it would be scandalous without carrot cake! Yours look great. Grace, you sold me on the almost pound cake...looks delicious and yes, Easter without carrot cake does not feel like Easter. I love this! The carrot cake is bursting with flavours!! 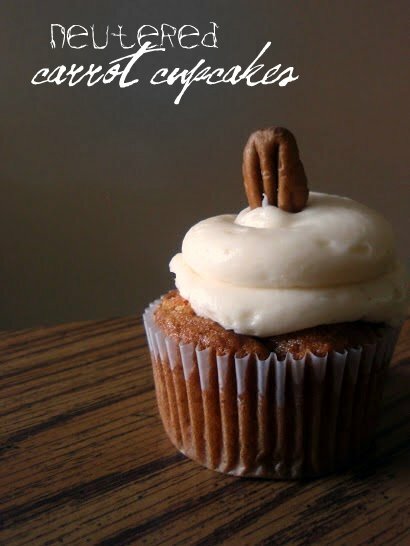 Carrot cake is my favorite so I know these cupcakes would make me a happy lady. BTW do you watch Scandal?